Trolling for striped bass and bluefish is a very effective method for covering large areas in search of actively feeding fish, and trolling can be especially effective for targeting large stripers in shallow waters. One of my favorite striped bass fishing techniques is simply trolling a long plastic tube lure very slowly along New England's rocky coastline near structure and drop offs. Tipping the tube lure with a live sand worm adds movement and leaves a scent trail in the water, and is a proven combination for catching stripers and bluefish. Trolling a tube lure for striped bass requires trolling very, very slowly -- between 1 to 2 miles per hour. 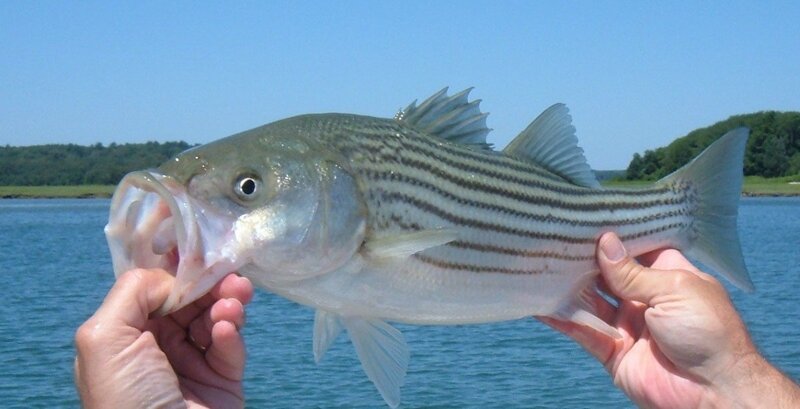 Stripers are opportunistic feeders, holding near structure and along drop offs or patiently following schools of bait fish while waiting for ambush opportunities. The large tube lure trailing a sand worm and slowly undulating through the water can entice even a big striper to strike. Striped bass have a well-defined siense of smell, and they can detect and follow the scent trail left by the sand worm. 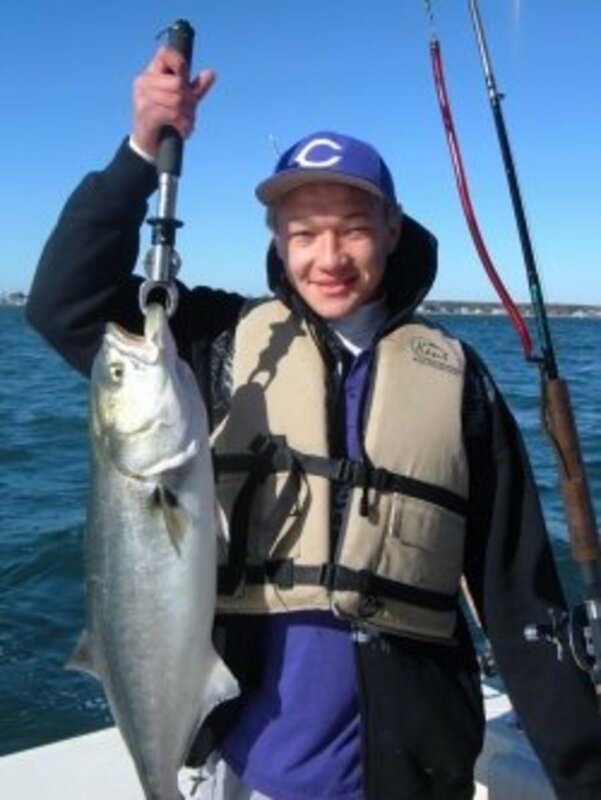 The tube and worm combo is also irresistible to the more aggressive bluefish. Use quality swivels and terminal tackle to reduce line twist caused by trolling the spinning lures, spoons and tubes through the water. Tie a large barrel swivel to the main line, and then use a snap ring to connect a snap swivel to the barrel swivel. The back-to-back swivel arrangement reduces the line twist and adds weight to trolling rig, allowing the lure to sink a little deeper in the water column. To rig a tube lure for trolling, start by making a leader. 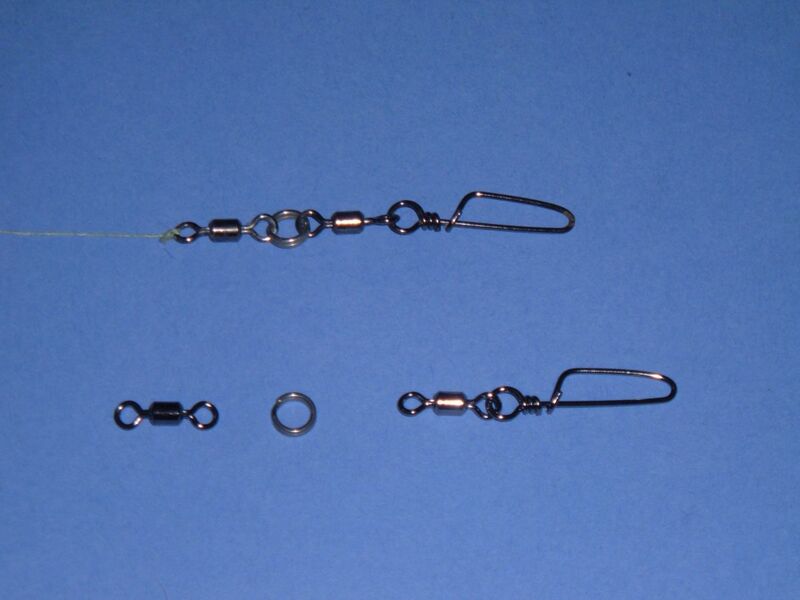 Tie one end of a length of heavy monofilament line through the eye of the tube lure, and then tie the other end of the leader to a stainless steel barrel swivel. Connecting the barrel swivel from the leader to the snap swivel at the end of the main line further reduces line twist and makes it easy to switch between different trolling lures, spoons and tubes. Add a live sand worm or scent soft plastic to the trailing hook of the tube. The sand worm increases the action of the lure and makes it even more appealing to hungry fish. The live bait also leaves a scent trail in the water for the fish to follow to your hook. What is a Tube Lure? Trolling a tube lure designed specifically for stripers is a very effective weapon for finding and hooking up with big striped bass and aggressive bluefish. These plastic tube lures range in size from 12 inched to about 24 inches long and resemble eels -- one of the favorite prey items of striped bass. Tube lures are sold in various colors ranging from hot pink to black. A red tube lure between 16 to 24 inches a good choice. 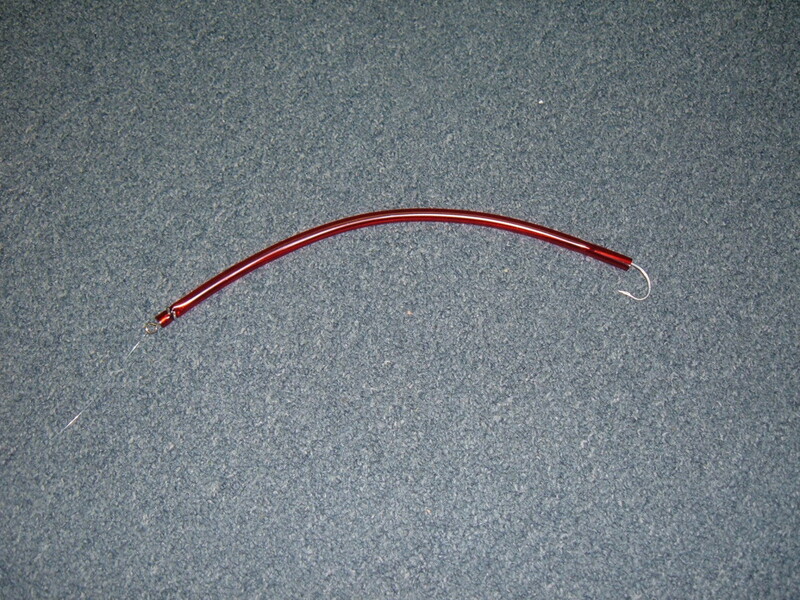 If you can find it, try a 24" T-Man Custom Tackle Scarlet Snake tube worm. Unweighted, the tube lure is effective in shallow water up to ten feet deep. In deeper water, attach a trolling sinker to the line above the leader to add weight without impacting the movement of the lure. 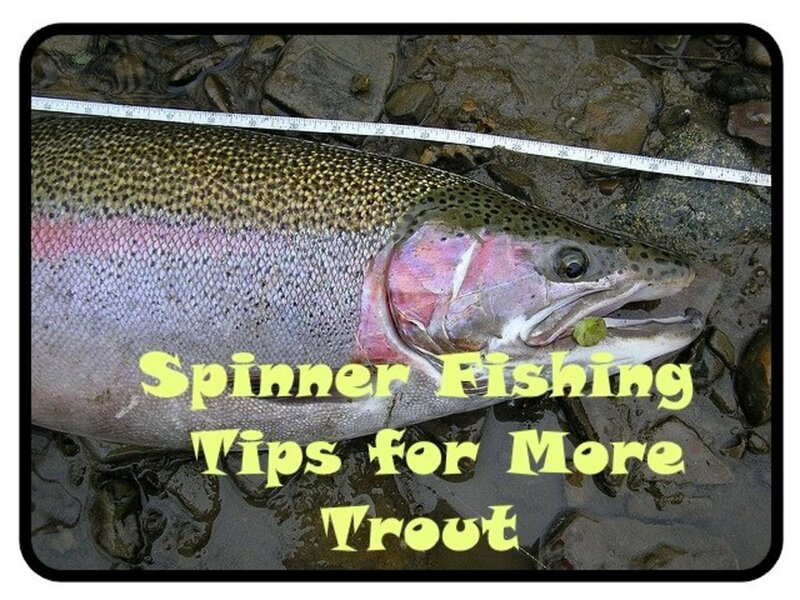 Troll the tube and sand worm combo very slowly near structure, rips, and dropoffs to increase your chances of hooking up with blues and stripers. Even small stripers are fun to catch! Whether on inland waters or just offshore, trolling for striped bass using a tube lure tipped with a live sand worm requires working the boat in fairly shallow water and in close proximity to structure—primarily among rocks and piers and along rips and drop-offs. Trolling the tube and worm combo very slowly is essential to presenting the lure with the proper action to entice a strike. Ideally, slow the trolling speed down to between 1 1/2 to 2 miles per hour -- the slower, the better. When trolling near rips and currents, troll with the current and follow the inner edge of the rip line where the moving waters push up against the flat water. 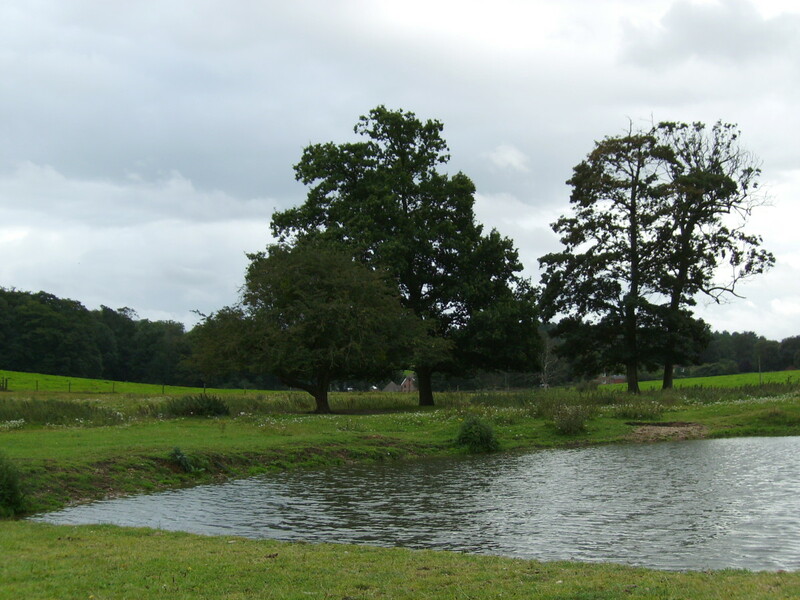 When crossing the current, try to angle the boat downstream and keep the speed low. Fish will often strike along the edge of the rip. A depth finder is an essential tool for effective trolling, helping to show the depth of the water as well as the contour of the bottom and marking drop offs and holes. A quality depth finder also shows the temperature, boat speed, the bottom structure, and will even mark fish and clouds of bait. 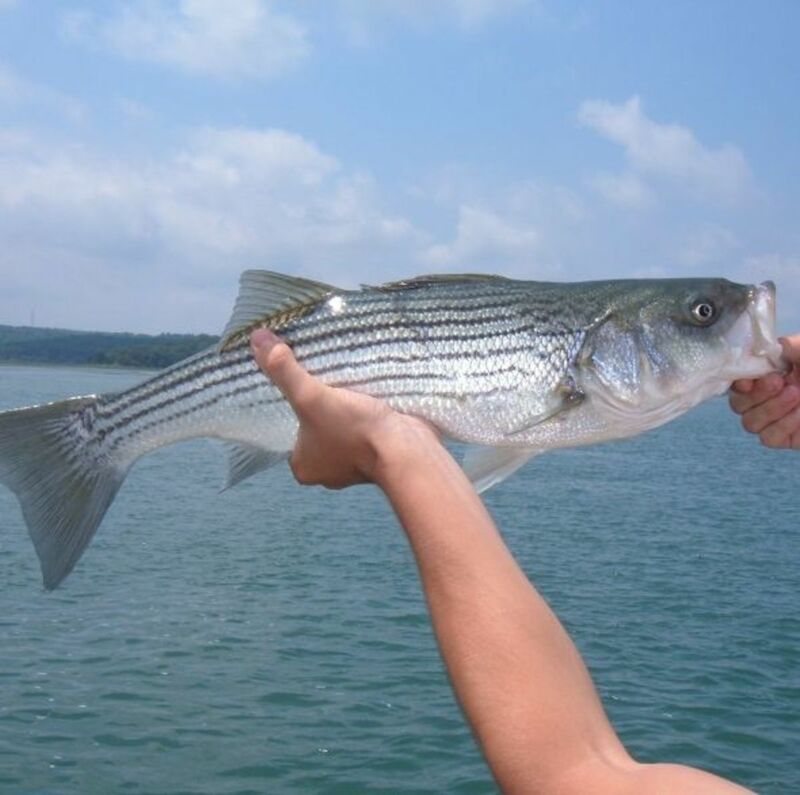 What is Your Favorite Method for Catching Stripers and Blues? Gulp eel and sand worm lures add movement and a scent trail to your trolling lures. Most big striped bass are females. 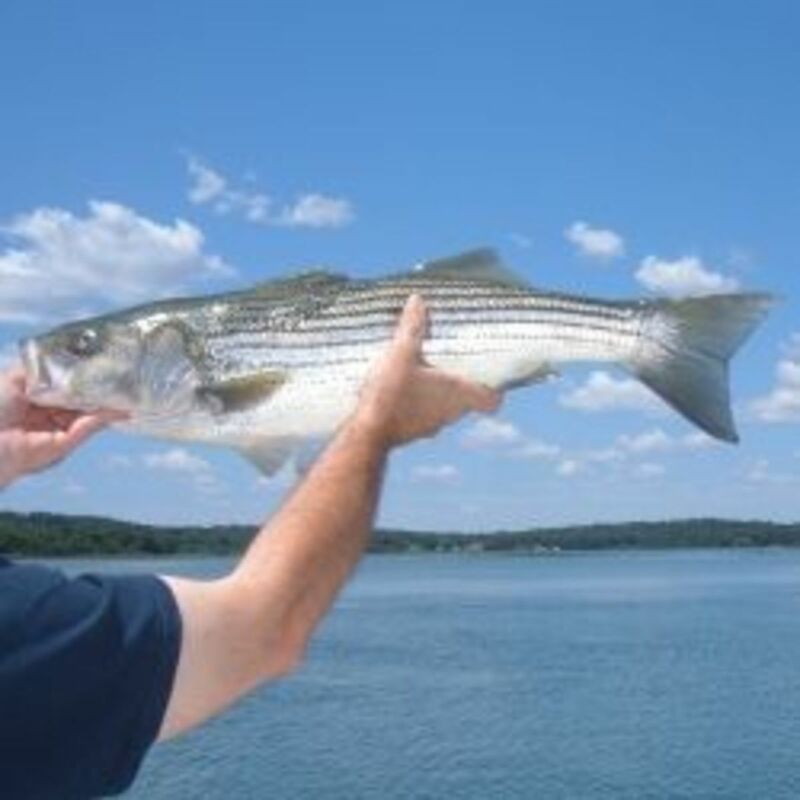 Releasing large fish helps to ensure strong striper populations. 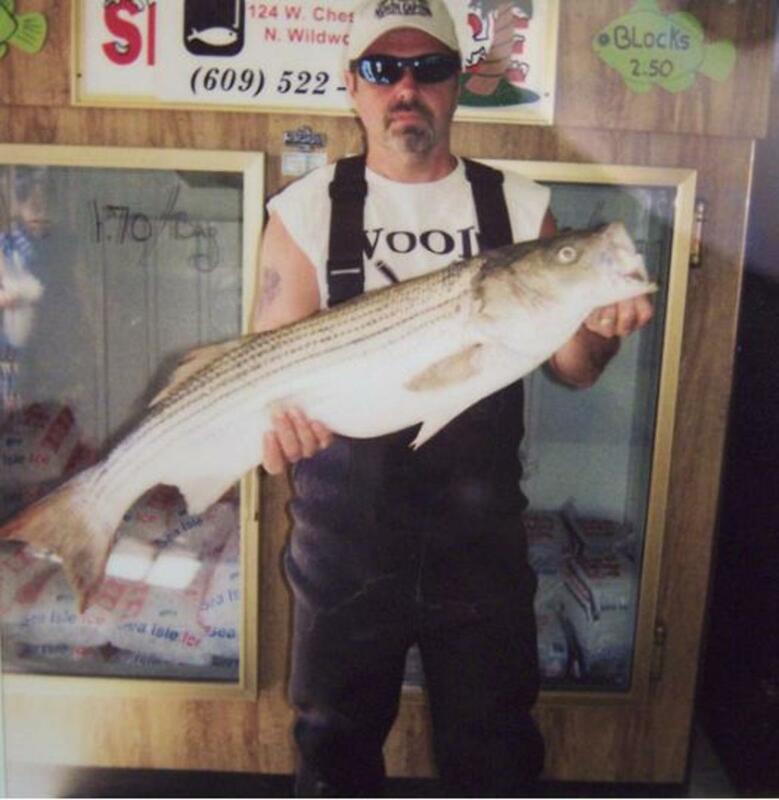 Most trophy sized striped bass - fish measuring 50 inches or longer - are usually females. Known as cows, these large females lay many times more eggs than their smaller sisters and are essential to maintaining healthy populations of striped bass. Safely releasing large cows helps to ensure future generations of these spectacular fish for years to come. 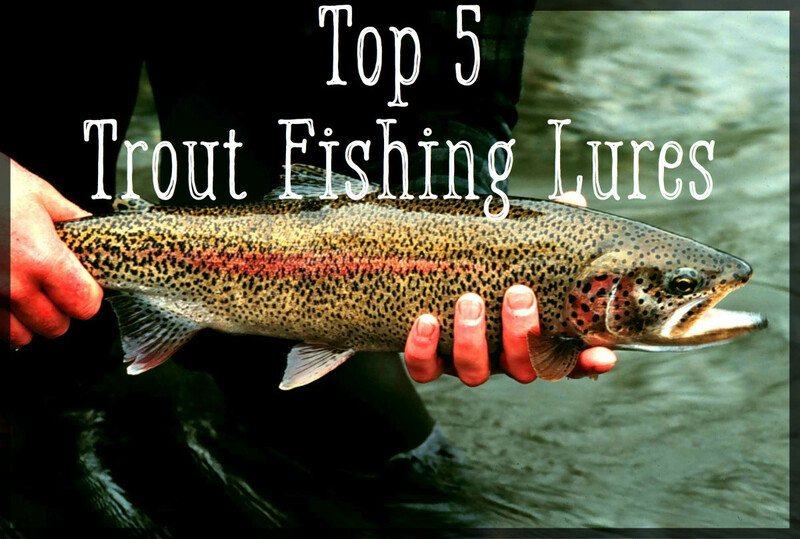 Successful catch and release fishing begins with your fishing tackle. 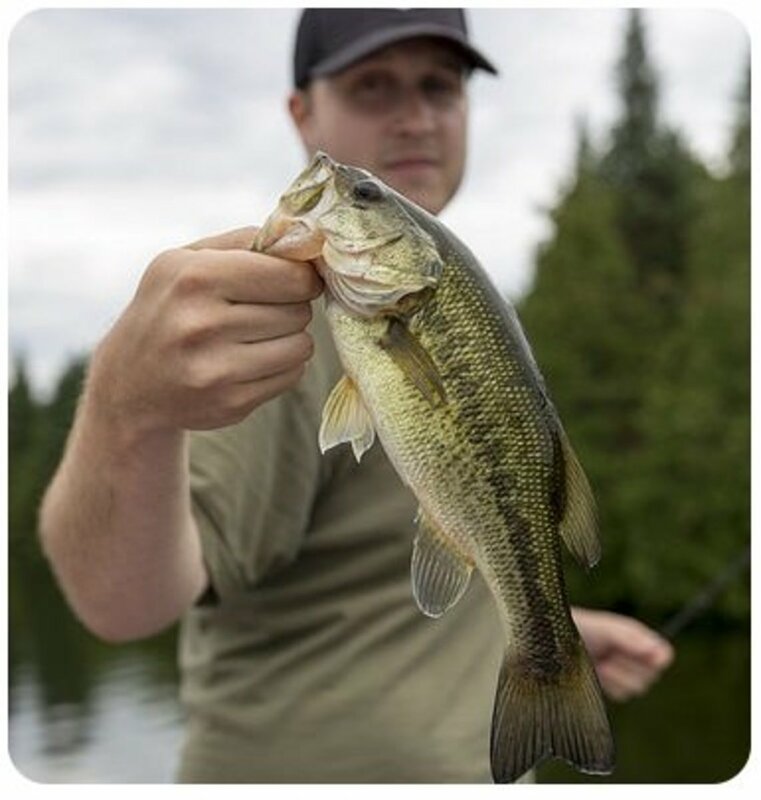 Circle hooks are very effective, and setting the hook properly usually results in catching the corners of the bass's mouth. Circle hooks are swallowed much less frequently than traditional hooks, saving unnecessary internal injury to the fish. Remove the barbs from the treble hooks of lures and poppers. Treble hooks often cause deep wounds, and imbedded hooks require pliers and extra force to remove. Use a set of pliers to simply flatten the barb, or use a metal file to remove the barb quickly while sharpening the treble hooks. A barb is not necessary to hook and land a high percentage of aggressive striper hits; keep the line taunt and the rod tip high while playing and landing your fish. Landing the fish quickly will help to keep the bass strong for a safe release. Grab the striped bass firmly by the lower jaw, and use your other hand to support the mid section of large fish while lifting and holding out of the water. Do not hold the fish by the gills. Use a hook extractor or pliers to remove imbedded hooks. 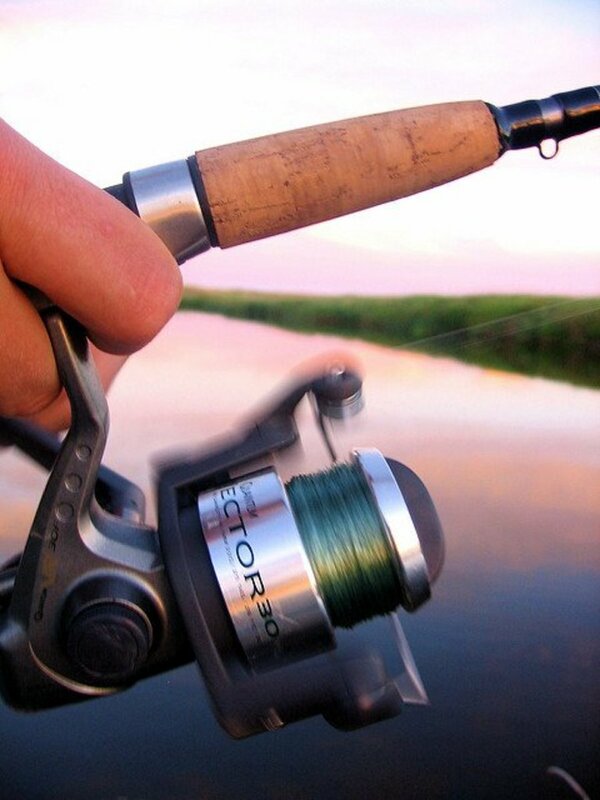 Grab the hook as close to the point as possible, while gently yet firmly twisting and backing out the hook. Pliers or an extractor provides extra leverage without putting additional pressure against the fish. Even though you should return the fish to the water as quickly as possible, releasing an exhausted and disoriented fish before it has time to recover is lethal. Hold the fish in the water by its tail while supporting the midsection, and within a few minutes, a healthy and uninjured fish will begin to regain its strength. Taking the time to allow a tired fish to recover fully before swimming off on its own will significantly increase its chances to survive and to fight again on another day.